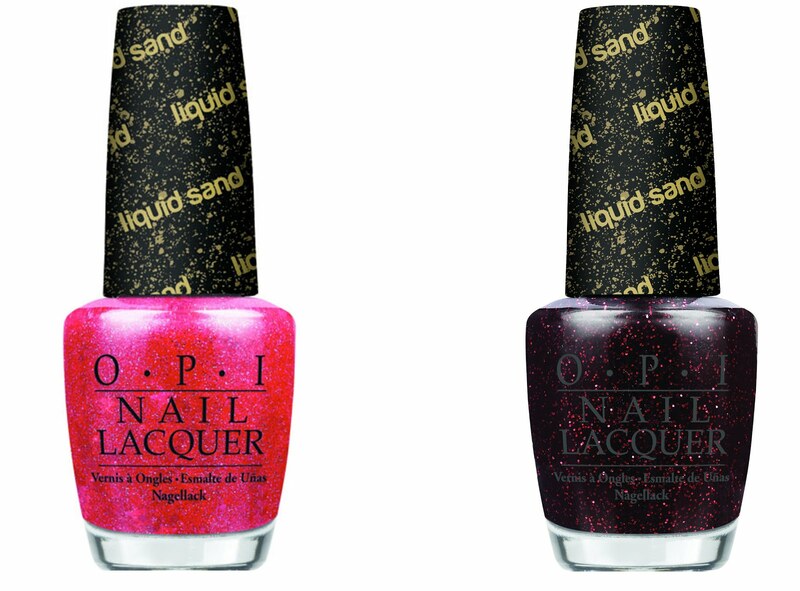 Have you seen the amazingness that is OPI Liquid Sand nail polish yet? This innovative polish is part of OPI's Mariah Carey Collection for Spring 2013. They're glitter polishes -- but with a unique finish that's supposed to be seen without top coat, which creates a pebbled and textured matte look. They're honestly not like anything I've seen before in nail polish! This giveaway has a retail value of $18. To enter, use the Rafflecopter widget below. Good luck! This giveaway ends on Saturday, February 9 at midnight. One winner will be chosen AT RANDOM on Sunday, February 10. Maximum of SIX ENTRIES (one for each way listed above). Multiple entries will be disqualified. Giveaway is open to US residents only. Gorgeous colors! I love OPI! My favorite thing is they both have glitter in them! Great colors. I've been going back and forth on whether to purchase the sand polishes b/c I fear the gritty texture. With each post I see, however, I get closer and closer to purchasing some of them! Honestly, I was not feeling this collection at all. i guess texture just isn't my thing; but then swatches of these polishes with a topcoat on started popping up and they were just stunning. OPI did a great job matching the glitter to the base colors. I've never seen a finish like the liquid sands. I have never seen anything like these, I am excited to try the texture! fav thing is the glitter, and you can wear them matte as they are - sandy, or with a top coat so it gives them a new look, or layer them over other polishes - many possibilites! I would love to try this collection! The unique finish is my favorite part. My favorite thing is the glitter! I heart glitter polish! I love the texture! ! I didn't know they had different shaped glitter in them! I have the purple one and love it! These look like OPI's version of Zoya's PixieDust. Would love to try OPI's version! I'm excited to try this type of finish. I just purchased one of zoya's versions in beige (haven't gotten it yet), so I'm excited to compare brands! I love the idea of the texture. Can't wait to try it!! I'd love to try this texture! I love texture and matte polishes. I've wanted to try these. They're so different from everything else I own, which is what I love! I love these polishes because they are so much more sparkly than you'd expect! Its fun to switch things up. Beautiful colors! I've been wanting to try the Liquid Sand polishes from OPI! love the colors and the finish...been dying to try these!!!! I love the finish on these and the fact that I haven't got to try them! I like the colors and the finish. Ever since a blogger from India started swatching what she calls "sandy matte" last year I have been wanting to get hold of one of these . . . I love the uniqueness of them. It's not something you can just replicate with a topcoat or some glitter! I love how Stay the Night looks like smoldering embers on your nails! I just love how main stream polish companies are now thinking outside the box creating these polishes. Thank you for the giveaway! I have been dying to try these. I hope I win! I've been wanting to try this since I first heard about them. Winning these would be amazing. I think the texture of these is interested. I'm curious as to how well they wear seeing they are not meant to have a top coat. That they are OPI! I love OPI polishes! I love the candy apple red one, in particular - love the glitter! I'd love to win these! I'm a big fan of OPI polishes! This sand finish sounds amazing! Its something so different and fun! I love mattes and glitters- So I think this is a match made in heaven. Also, the black and pink of stay the night looks phenomenal. The colors and they are something different. I've never tried the sand ones yet would love too! They look so different. The textures are so great! Ive been hesitant to try them so this would be the perfect way for me! These look like they would be a lot of fun! The color and texture, I am always looking for something fresh and new! I'm just curious to try the textures! I really want to try these, they look amazing! my favorite thing about these is the matte glitter effect, and the texture is a great new trend! Never tried the sand polish but willing to see how the effects would be....glitter is always so nice and sparkly. Stay the Night is a combo I've never seen before...awesome!! I love that the finish is kind of matte but they still sparkle! that their diffrent and uniqe i have nothing like thhat in my collection and would love to try it. They're so new and exciting for OPI I love the unique factor! I love Stay the Night with top coat.. I really want to see these in person because I'm not sure yet how I feel about them to be honest! It's so hard to know for sure without trying them myself, but that's just me. They're unique. Stay the night looks amazing with top coat too fromw hat I've seen! I love the glitter and the colors! I love the colors, especially Stay the Night. Loving the colors and the textures! Thanks for the chance! I love that they're DIFFERENT! My favorite thing about these polishes are that they sparkle! Glitter nail polish is my favorite kind of nail polish. I love the colors!! Great vibrant shades! I love that their from the Mariah Carey Collection for Spring 2013 and the colors and texture. love the bright, girly colors! Pick me! I love em. I haven't tried these yet but would like to! They look so pretty and I love sparkle/glitter. =) Starry night looks fab. I really enjoy the way you can wear these two ways- with or without top coat. Very pretty! My favorite thing is the matte texture - very unique! I love the colors!! so pretty!! I havent tried them yet but I love how that black has the red color glitters!! They're something different, and they wear really well (for me at least). I'm not so sure about the liquid sand yet, so this would be a great way to try it! Thank you for hosting such a great giveaway. I love the color the glitter and the texture. The colors - I really want to try them out! I love love love the texture! As a gal that prefers cremes & typically avoids glitters I was pleasantly surprised by the incredibly unique & lovely texture. I really love the purple one (Can't Let Go I think it's called) & would love to win these & try more colors! LOVE the textured look these polishes create! The fact that they are textured! Favorite thing would be that the wife would be happy to have them! I love how they are so unique in concept!!! Their colors are absolutely gorgeous! the glitter! i am into anything sparkly! I love how unique they are because of the grainier texture! So cool! Thanks for hosting this! I like the shimmery texture. It's gorgeous. I love that they are from a brand I love using - OPI. Also that both colors compliment my complextion. My favorite thing about these polishes is the color combo of the polish base & the glitter! I like that they're totally unique! I love the colors (great mix of base and glitter!) and I like the texture. It's so unique. Loving the hot pink glitter in "Stay the Night"! such a fun combination with the deep burgundy! I love the unique texture combined with glitter! I love how they apply very smoothly! I like how sparkly they are. I love the cool sandy texture of these!